WCD staff monitor zooplankton in the spring and fall or on an as-needed basis deep-water locations of area lakes. 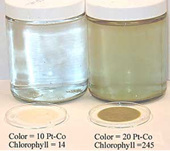 In addition to in-lake water quality sampling, zooplankton sampling can provide further insight into the function of the ecology of the lake. 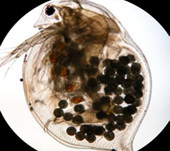 Zooplankton, or the tiny animals that live near the surface of oceans and lakes, are important to lake ecosystems because they graze on algae, keeping the lake's chlorophyll a concentrations in check. In some lakes, zooplankton grazing may lead to Secchi disk readings that are better than may be expected from total phosphorus levels. The study will give insight to the species and numbers of zooplankton throughout the annual cycle.